Any runner knows that a steady pace is key to sustained success. Rachel Stern understands this well, having completed over a dozen marathons while serving as senior vice president, general counsel, and secretary for FactSet Research Systems Inc., a leading provider of financial and economic information and global analytics, including more than 1,000 datasets and databases, news sources, and exchanges. Stern has built a strong legal team from scratch, while helping the international data and software business maintain more than 16 years of positive earnings growth. And neither Stern nor FactSet have plans to slow down. When Stern first joined FactSet as the first and only lawyer in 2001, the company only had 400 employees. “Of course it was scary at first,” she says. “Large firms teach you how to be a great lawyer, but not a general counsel.” Today, FactSet has more than 6,000 employees spanning a dozen countries, providing customized analytics and data tools to companies around the world. Stern typically begins each morning with a call to one of FactSet’s 29 locations, starting with one of the company’s two multi-shift facilities in Hyderabad, India, and Manila, Philippines. “No day is boring, nothing is ever the same,” she explains. Stern reports directly to the CEO, and meets formally with each of her seven direct reports every week, using technology to stay connected across locations and time zones. Stern’s background prepared her well for the diverse and complex challenges she faces at FactSet. She has a BA in Economics and Art History from Yale, studied at the University of London, and received a prestigious Fulbright Scholarship. After graduating from the University of Pennsylvania Law School, she clerked for Chancellor William Allen at the Delaware Court of Chancery, where she was encouraged to think hard about the consequences of her legal choices. 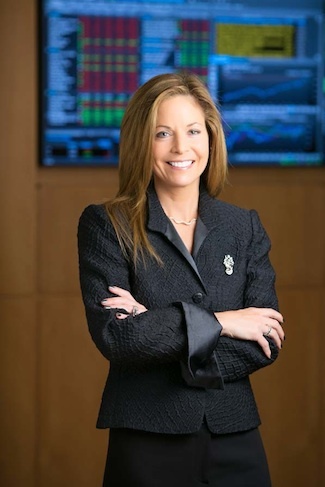 She then joined Cravath, Swaine & Moore LLP, where she eventually steered toward FactSet. “One of the most challenging things about starting from scratch is that you have to convince people that you are value added,” adds Stern, noting that one of her first challenges was to encourage the sales team to utilize client contracts. “You have to demonstrate to people that there’s a good reason to add an extra step.” After one of Stern’s contracts proved to be profitable, she started to build her reputation and earn the trust of her colleagues. From here, Stern’s responsibilities began expanding beyond core legal functions. Now, she leads an inspired and dedicated strategic-resources team, made up of more than 140 FactSet employees across the globe, including leaders from legal, human resources, facilities and real estate, investor relations, training and development, and the heads of two offshore offices. Now one of Stern’s priorities is to always be looking for ways to support her employees in becoming better problem solvers. “If somebody comes to me with a problem, I also want them to come with some sense of a solution,” she says. Employees who demonstrate both engagement and effort are ideal candidates, and Stern wants people who care. But she also looks for independent thinkers who aren’t afraid to share their views. That same candor and drive is what helped her build a strong team responsible for all of FactSet’s legal needs. Although she gets a thrill from working at FactSet, Stern knows that taking time away to engage in stimulating activities is what makes coming back to work fun every day. She has learned a lot about effective time management—she raises three children and is training for her 15th marathon—and also continues to nurture her love of art, serving as a director of the board of the Neuberger Museum of Art at SUNY Purchase and as the treasurer of the American Foundation’s Courtauld Institute of Art.